Sometimes, we’re just not sure why you can’t download a file from an ftp-server to your local-computer. 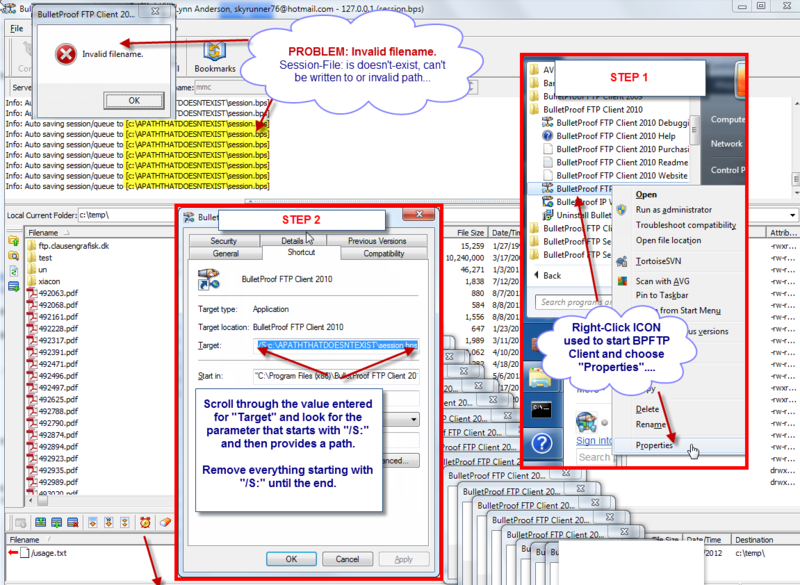 In order to test this, please follow the below steps that will allow you to connect to a test ftp-server, navigate to a file on the ftp-server and download a file from the ftp-server to your local computer. This test allows us to isolate the program to a known ftp-server with files that we know you can successfully download. The file should download and you’ll see it under the “Local Current Folder” as the file “unicode.txt”. Double-Click this file and it will open a text-editor with a bunch of sentences wrapping around. THAT’S IT, YOU HAVE JUST CONFIRMED THAT BPFTP CLIENT CAN SUCCESSFULLY DOWNLOAD A FILE. Today, we are proud to release a new version of our BulletProof FTP Client for Windows v2010.74.0.74. For all customers with a current license, please download/install the demo/trial version from our website and it will automatically update itself to the full-version on your computer. * Fix: It was possible for the ftp-server to send a “mangled” directory listing (that does not adhere to standards) which could cause the program to raise an Access-Violation. * Update: In processing *very* large directories (with over 1000 files), the program would “freeze” as it processed. Added hooks to process Windows-Messages. 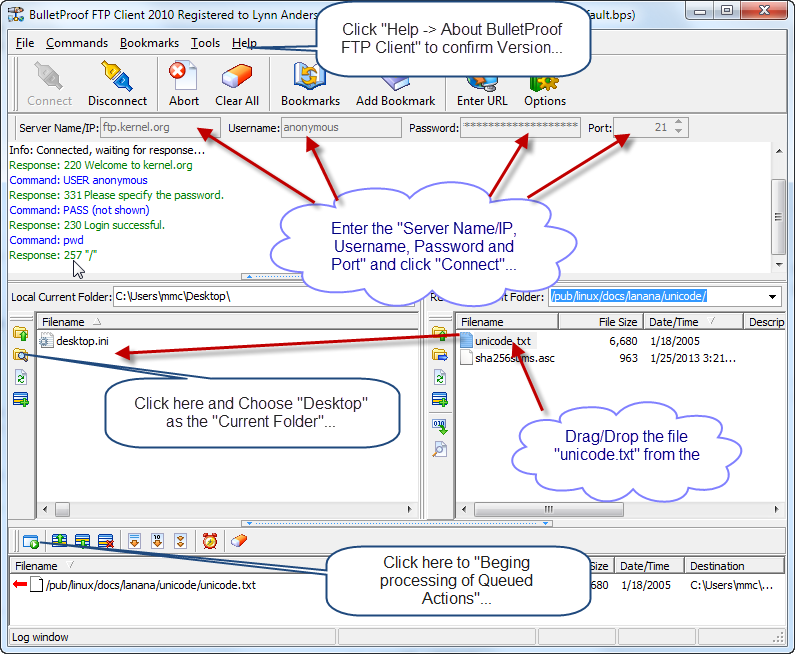 BulletProof FTP Client 2010 was released in Nov 2010 and signifies a major-revision to the the core program. This posting will contain a list of current and commonly asked questions, howto’s and other types of useful information. Please check back often, as we will continue to update this posting as time goes on. Q: I bought BulletProof FTP Client already, how can I get this upgrade? A: Check your email, it’s already been sent to you. A: If you didn’t get the email, then either you have a new email address or your previous order has an expired support-entitlement. In both cases, please continue over to the Members section of our website and login. If you don’t have an account, you will need to create one using the previous order details. Q: When I try to enter the Registration/License-Code, it keeps saying “Invalid”. A: This is because the code is not being entered exactly as it appears in the email OR you are using a code from a previous version. When entering the registration-code, please copy/paste it into the program; as it’s nearly impossible to enter every character in perfectly. A single wrong character will cause it to not work. BulletProof FTP Client 2009 will not accept a registration-code from a previous version. Please check the email you are using the registration-code from an make double/triple-sure it says 2009. Q: My previous order’s support-entitlement has expired. But I want the latest version, how can I get it? As a previous customer, we can provide an upgrade-coupon that will lower the cost of upgrading. To obtain the coupon-code, please login to the Members section of our website. Here, you will be able to “Link” your previous order into the account and get the coupon-code. Please continue over to the Members section of our website and login. If you don’t have an account, you will need to create one using the previous order details. The latest version of BulletProof FTP Client 20009 was released today. This new version includes a number of enchancements to the Bookmarks Manager, miscellaneous bug-fixes and a new “DEBUG MODE”.